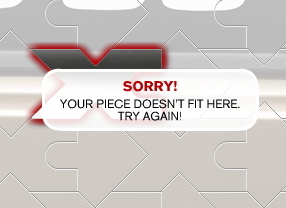 Once you get your puzzle piece, drag it onto the billboard and set it down. Problem is, our piece doesn't seem to fit anywhere we put it. We tried five or six times before resigning ourselves to the fact that this billboard -- this piece of outdoor social media art -- is fated to launch in some faraway place without our contribution. The Swedes will likely feel the void. "A Piece of Your Lov" is part of a six-part campaign. Each component was a month long and can be browsed on the website. The billboard, which will be erected later this year, marks the campaign's culmination. By Euro RSCG 4D Amsterdam. I just tried and it worked fine! Press the help button below the piece for some hints. Just did. Still too hard. Wondering if it would've been easier if all the pieces were different shapes. My piece was this funky gradient gray that looked like 10,000 other gradient grays. Lots of squinting action on my end. Just so you don't feel left out, I just added I Lov AdRANTs to the XC60 jigsaw puzzle! Enjoy your 15mm of fame!